Graphical Overlay architecture adds Timecode / Feet and Frame burns, plus programmable Punches and Streamers for ADR and Foley recording. Generates beeps for ADR and Foley recording. 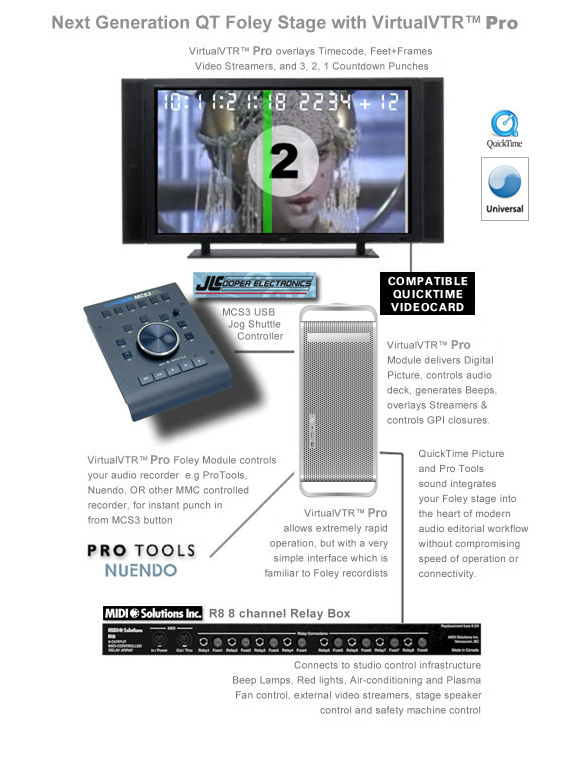 Interfaces with MCS3 and Shuttle Pro controllers as a complete Foley recording control synchronizer, handling Video, streamers, GPIs, beeps and control of Audio deck (eg Pro Tools or Nuendo). Direct Import of non-movie files, eg MPEG2, AVI, DV Stream, automatically creating reference movie to house timecode track. Additional direct-video out capability for mismatching codecs, by translating via graphics overlay buffer. Ensures that *ANY* quicktime-compatible codec (eg: H.264) can be output genlocked via video cards like AJA Kona. with existing foley or ADR control systems. Many other high end functions for professionals. has a raft of 'additional features. a compatible Video card is required.